It’s becoming a regular occurrence that I spend a lot of time in Norway. While I go there for business, I try to explore the country on a personal level. I’ve done the Hurtigruten Cruise along the fjords, which was fantastic, but it was time to do some exploring on the ground. So, at the end of my latest business trip, I enjoyed a hike in the fjordland just outside of Stavanger. 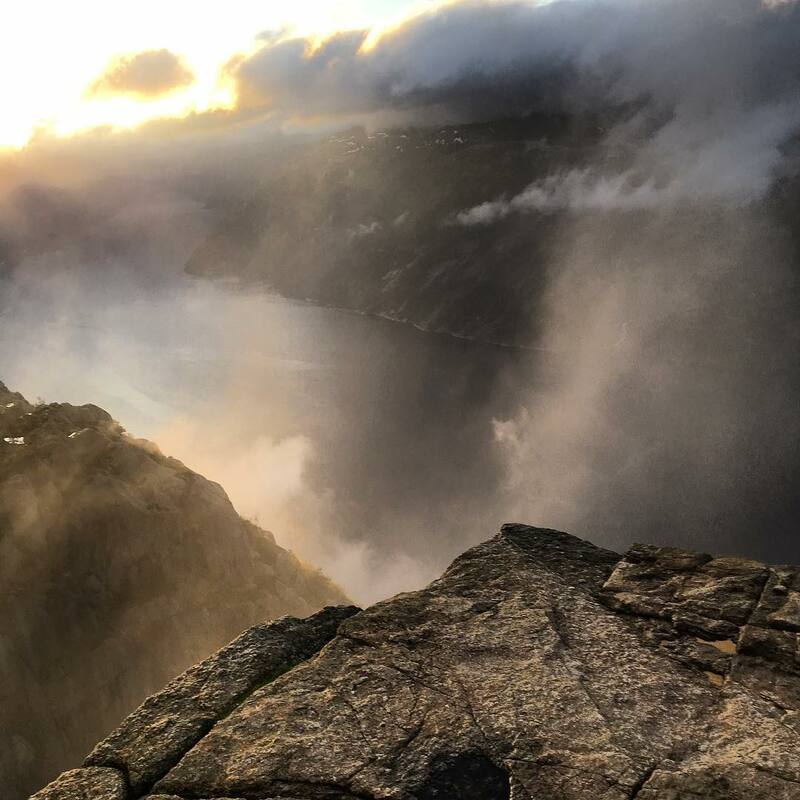 The mission: hike Preikestolen (Pulpit Rock) in the DARK to be able to enjoy the sunrise overlooking the stunning Lysefjorden. Following another amazing stay in Trondheim, I flew to Stavanger with a colleague for a much anticipated and much hyped hike. We booked the sunrise Preikestolen hike with a small local company Outdoorlife Norway AS. They have a wide range of activities ranging from city strolls to multi-day hikes. The weather was gorgeous leading up to the day of the hike, so we were extremely excited for the opportunity to do this hike when the scenery would be at its best. Norway isn’t exactly known for being sunny, so it probably should not have come as a shock when massive rain was predicted for the day of our hike. Outdoorlife Norway was great to work with when the hike was rescheduled due to the weather. Another colleague was due to join us on the hike, but had to back out when it was rescheduled. Outdoorlife immediately provided a refund with no questions asked. We thought we were smart to schedule our hike for a Norwegian holiday, which left us time to explore when the local businesses would be open. When the rain interfered, we had to make due with exploring in the rain while nothing but souvenir shops were open. It was still interesting to walk around and see the city. Unfortunately, it’s a very touristy area as Stavanger is a cruise port for larger passenger ships. We did manage to find one semi-quiet area in Gamla Stavanger, which is the “old town” area. It’s quaint and picturesque. Personally, I think the allure of Stavanger is what lies beyond the city in the fjordland. So, it’s worth the stay to enjoy the beautiful coastline. Planning for the hike was fairly simple. Outdoorlife’s website has an easy booking engine, provides all of the details for the hike upfront (inclusions, pickup times, etc) and the communication prior to the hike is good. The sunrise hike package starts at 1290 NOK per person (about $165 USD) and includes the guide, hiking poles, a head lamp, snacks during the hike, and a breakfast/lunch after the hike is complete. The guide will also take photos throughout the hike and you can buy a photo package before or after the trip. As for the hike itself, it’s a relatively easy hike if you have any experience or are in good physical condition. It’s approximately four kilometers each direction and there are a few stops along the way to break things up. However, it’s very rocky, so be sure to wear hiking boots versus hiking shoes to protect your ankles from rolling. As we hiked after the rain, the rocks were very slick and I (admittedly) slipped twice. Did I also mention that the hike starts in the DARK? Besides having to get up at midnight to hike (it’s Norway in the spring- sunrise is EARLY!! ), it’s a little scary to hike on the rocks without much light. However, the lamps work well and your eyes eventually adjust . Of course, the sun is out on your return and you’re now hiking downhill, so things seem easy! For our particular hike, the guide was great – personable, knowledgeable, and had a great sense of humor. We had a full group (eight people plus the guide), but private hikes are available. The weather was not fully cooperative, so it wasn’t the best hike I’ve ever done. Besides being muddy from the rain, it was foggy on the hike up and it did not fully burn off prior to sunrise. So, the view that you see online was not exactly what you see in my photos. However, I could see that with the right conditions, the view would be unreal. When we got to Preikestolen, I noticed it was possible to camp out there. There were two or three groups who had pitched tents close to the overlook. Personally, that is not my thing and a bit scary, but it would be one heck of a view to wake up to in the morning. Even with these small groups already in place, there were very few people around, which makes the sunrise hike totally worth the midnight wake up call. Preikestolen is Norway’s most popular hike and can get quite crowded during peak times. So, to be able to see this view without the crowds is an opportunity that should not be passed up. Finally, I should mention our choice in hotel. When looking at the map of Stavanger, we decided we wanted to stay within walking distance of the port and in the city center. So, we chose the Radisson Blu Atlantic. It was absolutely the right decision. The hotel is fairly large, but is clean and very modern. It overlooks a pretty lake and is a two minute walk to the port. A Flybussen (airport shuttle bus) stop is right outside of the hotel and if you are connecting anywhere via rail or bus, the station is just one block away. You really can’t get more convenient than that!